I was asked to make a Galette des Rois with a request to make it not taste like almonds. Luckily, Dorie has a recipe in Baking Chez Moi for a Galette des Rois which includes either lemon or orange zest. I thought that using orange zest would make a tasty Galette, but later I decided that a Galette with orange zest AND vanilla beans would be even better! So I started preparing my ingredients (minus the vanilla bean, which I forgot about at this point). I was mixing the orange zest and the sugar when I realized that I should add vanilla. I decided that if heaven has a smell, it smells like sugar, orange zest and vanilla mixed together. I didn’t want to wash my hands (but I did). After washing my hands of the sweet, sweet smell of heaven, I added the sugar mixture to some butter. It was this at this point when I decided that THIS is what heaven smells like: BUTTER, sugar, orange zest, and vanilla! I turned the mixture out onto plastic wrap in the form of a disc and refrigerated it overnight. The next day, I thawed out some puff pastry and cut out two 8-inch circles, placed the disc of heaven on one circle, put some egg wash along the perimeter of the circle, and placed the second puff pastry circle on top of that to seal it. I brushed the top with egg wash and placed the galette into the fridge. When my oven got to temperature, I gave the galette another coat of egg wash and scored a simple design on the top. I put it in the oven and let the Galette do its thing! The taste of the filling was just as good as I thought it would be. The orange and vanilla were strong, but not over-powerful, and there was no trace of almond (as requested). The pastry was crispy and flakey. 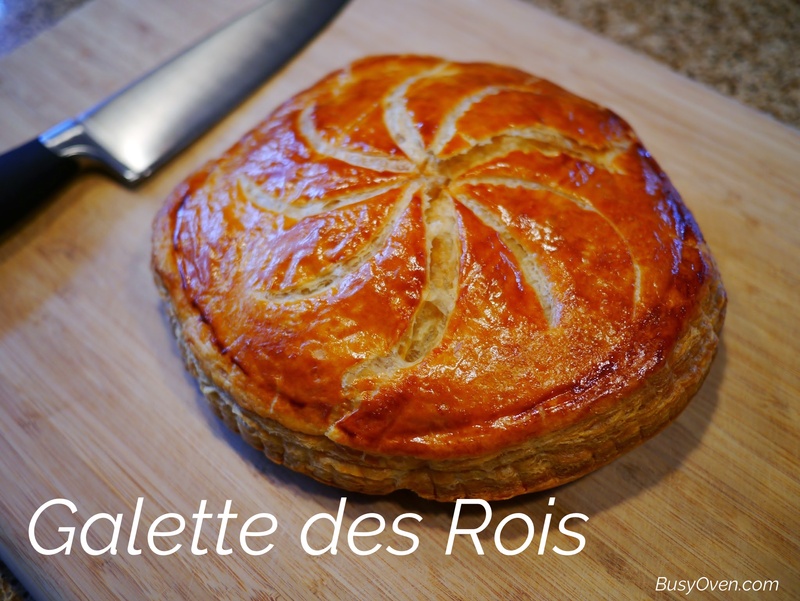 This is a quick and easy recipe, and I highly recommend including orange zest and vanilla beans to anyone making a Galette des Rois. Galette des Rois recipe on page 102 of Baking Chez Moi.